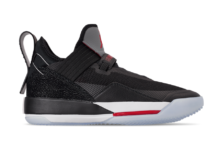 Jordan Brand has officially unveiled the Air Jordan 33, which will debut in a colorway dubbed, Future of Flight beginning in October. Dressed in a White, Metallic Gold, Black, and Vast Grey color scheme. This Air Jordan 33 feature a White-based upper with Gold accents on the tongues and Nike Air heels. Both Black and Red detailing throughout atop an icy translucent outsole completes the design. Look for the Air Jordan 33 “Future of Flight” to release on October 18th at select Jordan Brand retailers and Nike.com. The retail price tag is set at $175 USD. UPDATE: Nike releases official photos of the “Future of Flight” Air Jordan 33.